An open field, surrounded by trees. A small river just over the bank on one side of the field. Woods and mountains in the distance. Just after noon the first nomad arrives in a van with trailer in tow and begins to set up. Through the afternoon and into the early evening, nomads arrive. Each arriving nomad chats with his neighbors, sizes up the available space, and chooses a spot that feels right. Each shelter is unique and yet each is a variation on a common theme – a round, open, fabric structure with an awning like a sun umbrella – the workspace. And in the center, perched above the open tent, a round and private living space – yurt-like, dome-like or maybe free-form. The village grows organically as the nomads arrive. Some folks chose to cluster together, some prefer more distance and privacy and set up on the fringes of the village. The kids roam freely, checking out the new arrivals, and reporting back on what the river is like and the play spaces they have found in the bushes. 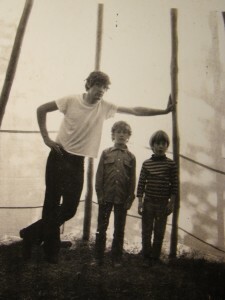 In Vermont, I built my tipi from a pattern in the bible that John and I used – the Laubin’s book, The Indian Tipi – Its Structure and Use. As I hand stitched the canvas together – some of the seams were 50 feet long and I ended up with a knot in my back as big as my fist – I imagined the Sioux swinging into the meadows along the Little Big Horn, and setting up their tipis in an open circle with the hubbub and organic chaos of dogs, kids, horses and dust. The Sioux tipis were private shelters. They were hunters and gatherers and were often out of village. They were horse powered, and couldn’t haul a lot of stuff. My nomads are makers, might be veggie-diesel powered. They need to bring their workspaces and materials with them. But like the Sioux, they will be on the move to where the grass is sweet and the “hunting” is good. This entry was posted in Nomadic Village, Sky High Shelters, Tipi Living, Uncategorized and tagged Laubin's, nomad, Sioux, tent, tipi, workspace on January 24, 2013 by macinessex. Why a shelter sky high? I loved being outside all day. I had a kick wheel for making pots with local clay tucked under the lean-to. Even in the tipi with a fire going I was “outside”. I could feel any change in the sky or weather through the white canvas. And the inside air never heated up – all the warmth came from the radiant heat of the fire on my body – just like the warm sun on a cold day. When I stood on this spot on the top of the hill where the snow had melted away, and I looked at the view of the valley and mountains to the east and the deep woods to the west, I realized that as soon as I put my tipi on this beautiful spot, I was going to lose this 360 degree view. The structure would be in the way. What if I could put the tipi up in the air and have an tent structure under it that could be open on all sides when the weather was fair. 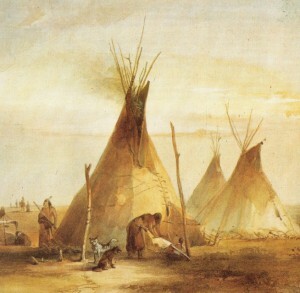 The smoke flaps on the tipi could be adjusted like a jacket collar to block the wind so the fire would draw well. Maybe the open tent structure’s fabric could adjust to block the wind or be wide- open to light breezes on a beautiful day. And that open tent space would become my kitchen and workshop. And at the end of the day my sweetheart and I could retreat into our tipi nest, sit around the small fire, talk, plan, make love and fall asleep breathing the cool evening air. But life changed. I married a woman with small boys. Lived in houses. Got a real job. Had a daughter. Got a graduate degree. Divorced. Fell in love. Got married again. Lived in an old school house. Made babies, boys this time. Got a bigger house in town. And a summer house. And a series of sailboats. And all the time I kept making drawings and models of my “Sky Tipi”. Two summers ago I asked my new friend Andy, an artist who had gone back to school to be an engineer, to work with me and we started to build the first prototype in the backyard. I started to call it my “Sky Yurt”. This entry was posted in Building, Sky Yurt, Tipi Living and tagged camping, tent, tipi on January 10, 2013 by macmacdevitt.